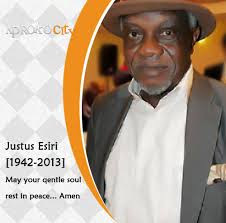 Veteran Nollywood actor Justus Esiri, who died on Friday 19th February was buried yesterday April 12th in his home town Oria-Abraka, Delta State. Kanayo O Kanayo, Rita Dominic, Bob Manuel Udokwu and other Nollywood stars paid their last respect. May his soul continue to rest in peace...Amen.